Fire scene at 714 East 82nd Street (PHOTO CREDIT Chicago Fire Department Chicago Fire Media). Chicago firefighters and police responded about 5:00 a.m. Tuesday to an apartment fire at 714 East 82nd Street with a report of jumpers out of the four-story courtyard building. Four people were transported to the hospital — one with life-threatening injuries to Level I Trauma Center Advocate Christ Community Hospital and one with serious injuries to Jackson Park Hospital. One victim with minor injuries was transported to Jackson Park Hospital and one victim with minor injuries was transported to St. Bernard’s Hospital. Battalion 23 was the fireground chief, and called for a 2-11 response about 5:30 a.m., and then immediately called for a 3-11. Battalion 17 was RIT Chief and Truck 16 was the RIT truck. RIT is a rapid intervention team, which stands by with rescue equipment, especially for fire crews that run into trouble while working on the fire. Battalion 21 was Plan Chief for the EMS Plan 1, which brings five paramedic ambulances to the scene. The EMS Plan 1 is a standard response at working apartment fires. Squad 5 was the Chicago’s rescue squad on the scene. The dual rig unit goes to all working fires in Englewood and other south side neighborhoods with a utility truck and a snorkel truck. 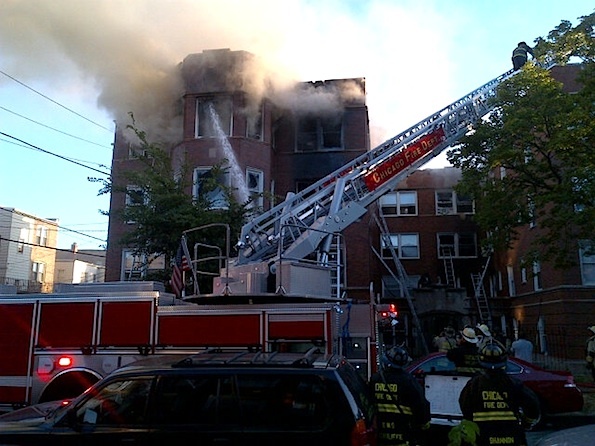 The apartment building had heavy fire on the second, third, and fourth floors. The fire response was elevated to a 3-11 alarm fire. Earlier in morning, Chicago firefighters worked on another 3-11 fire at 1924 Larchmont on the north side. At least two-hundered firefighters worked on each fire.